When you think of Christmas, how do you picture it? In my head, it is a winter wonderland full of snow, hot chocolate and marshmallows. Oh, and of course, the North Pole, Santa, his elves and his reindeer. No, I am not five. I am just currently stuck in a five-year old’s brain and always will be when it comes to all things Christmas. Picture this, it is freezing cold outside and snowing like crazy. You make a warm fire and a stifling hot cup of hot chocolate and settle down right next to your brightly lit up Christmas tree. Ok, now this picture is already sounding pretty cozy and kind of like my dream night (or really anytime of the day). So now for the question. What is the one thing that could make that picture better? 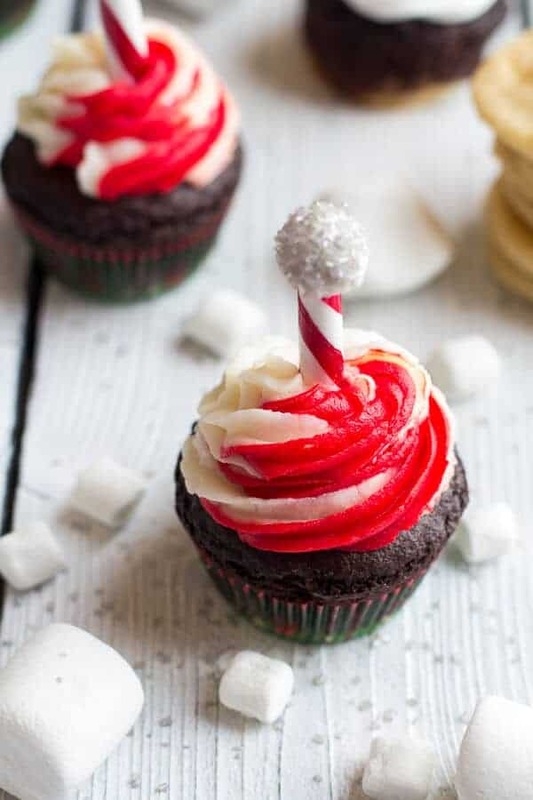 The look of this cupcake has been in my head for the longest time now, but it was only a week ago that I finally nailed down what flavor I wanted my North Pole look-alike cupcakes to be. Obviously, this idea came to me during a very snowy and picture perfect Christmasy morning hike. Do not let the long recipe scare you off. These are pretty easy and I gave you not one, but two frosting choices. A buttery, vanillay buttercream and a marshmallow frosting. Both are delicious, but if you are looking to go the easier route go for the buttercream. Sometime marshmallow frosting can be a little temperamental. Normally I am not into using food colorings, but for these I just could not resist doing a red and white swirl. It was a must for my “North Pole” themed cupcake. I still cannot believe how easy it was to swirl the colors together. All you need to do is add the red frosting to one piping bag and the vanilla frosting to another piping bag. Then place both bags into another large bag and use whatever tip you would like (I use the Wilton 1M) and swirl away. 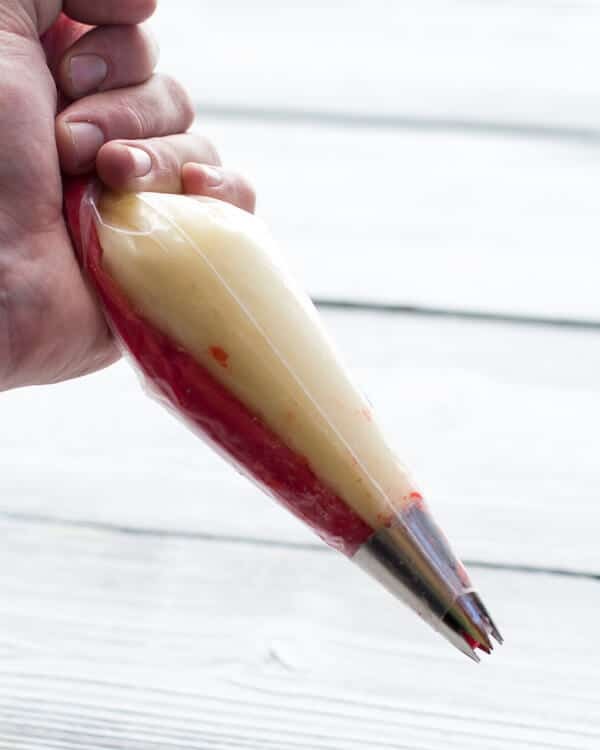 I swear, it really does work and if you are looking for something even easier you can buy this piping bag from Sur La Table that would probably be really helpful, especially if swirled frosting is a big part of your holiday baking plans. 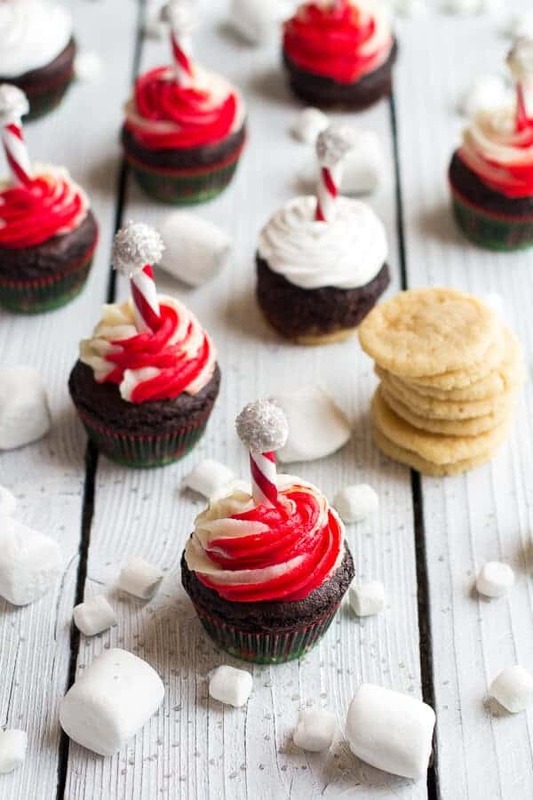 Next break some candy canes in half, dip the top in frosting and roll the frosting in some silver sprinkles. Now all you need to do is stick the poles right in the center of the cupcake and there you go. You have yourself your own little piece of Santa’s workshop. YES! So cheesy….I know, but it is Christmas! I would recommend drizzling the extra ganache all over the cupcake right before eating. 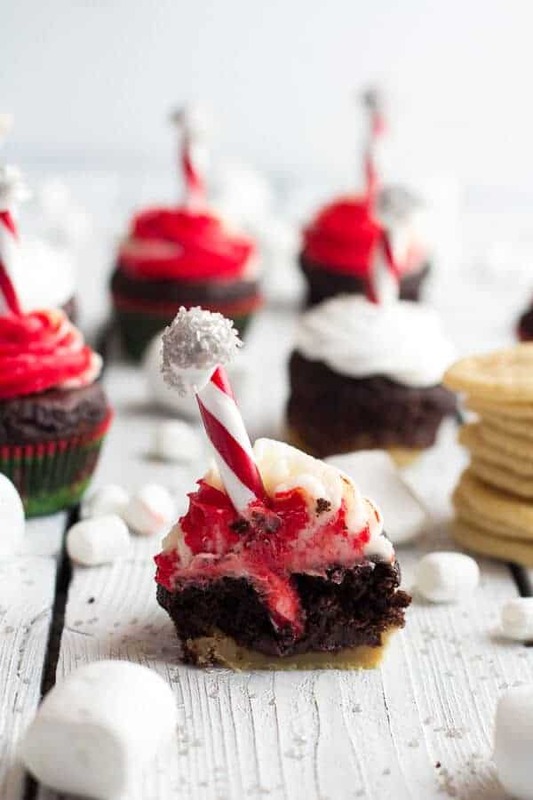 Oh, oh, oh and you could even add some crushed candy canes on top of the frosting. I would have, but I am just not the biggest peppermint/candy cane fan. Sorry, it is just not my thing…..yet! I have been known to change my tune about certain foods. These are pretty easy and I gave you not one, but two frosting choices. A buttery, vanillay buttercream and a marshmallow frosting. 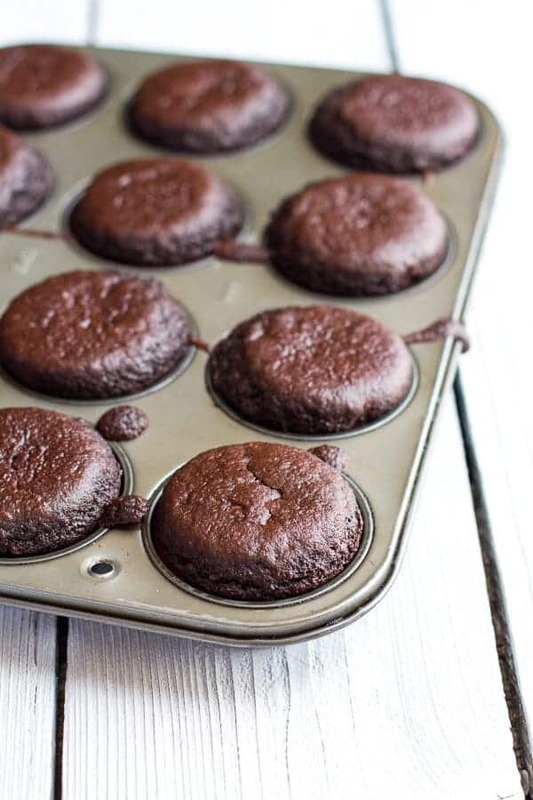 Preheat the oven to 350 degrees F . Line a 12-cup cupcake/muffin pan with cupcake liners. Set aside. To make the cookies. In a large bowl or bowl of a stand mixer cream the butter, sugar and vanilla until light and fluffy, about a full 3-5 minutes. Add the egg yolk and mix until evenly combined. Add 1/2 cup of the flour, baking soda and salt, beating until the dough forms a ball. Add the remaining 1/2 cup of flour and beat until the dough forms a ball. It will seem crumbly at first, but it will come together. Beat in the milk. 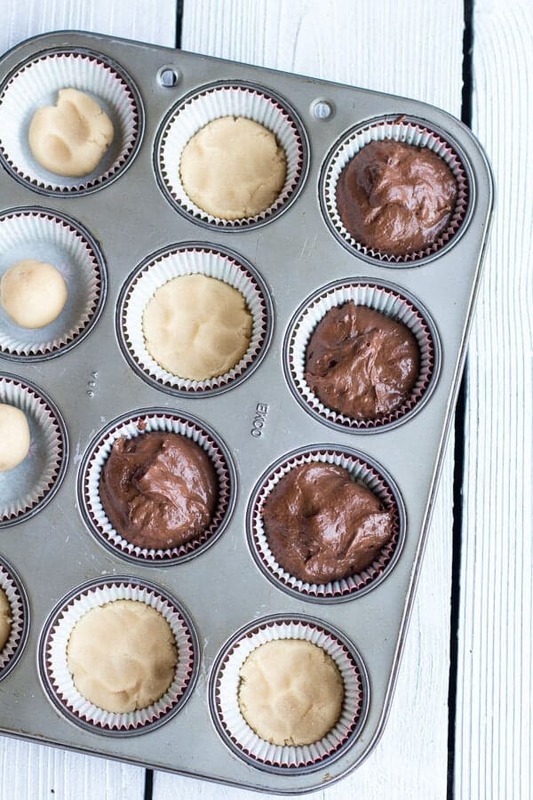 Roll the dough into rounded tablespoon size balls and then press the balls into the bottom of 12 cupcake liners. Place the cupcake pan in the fridge while you make the cupcake batter. You will have leftover cookie dough (YES!!). I would make some cookies with it! 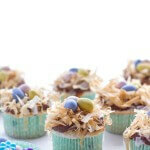 To make the cupcake batter: In a medium bowl, combine the flour, cocoa powder, baking powder, baking soda and salt. Set aside. In a large bowl whisk the canola oil, eggs, vanilla and sugar until smooth and combined. Stir in half the flour mixture and the coffee until lightly combined. Stir in the remaining flour and the buttermilk until just combined. DO not over mix, batter will be thick. Divide the batter among the 12 cupcake molds, placing the batter right over the cookie dough. Bake 18-20 minutes or until a toothpick inserted into the middle comes out clean. (I baked mine 20 minutes and they were perfect.) 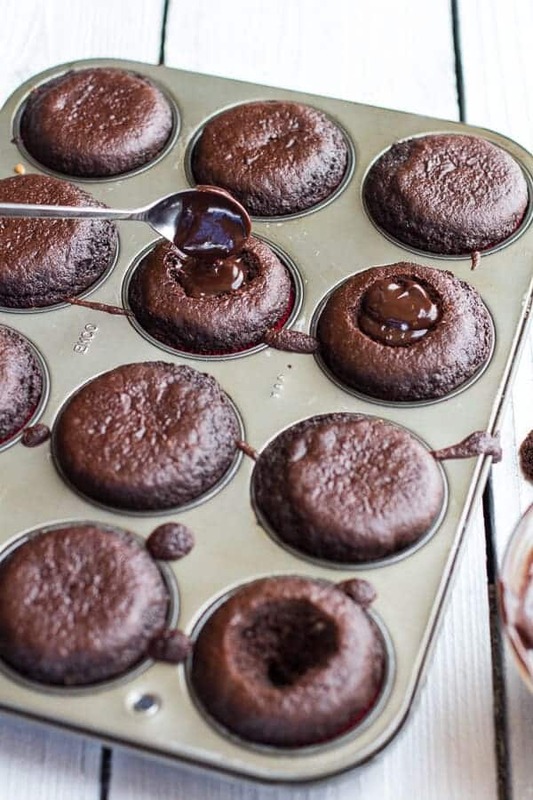 Allow the cupcakes to cool completely before filling with ganache and frosting. To make the buttercream frosting: In the bowl of a stand mixer (or large bowl with a hand mixer) beat together the butter and powdered sugar until smooth and fluffy, about 5 minutes. Add the vanilla, pinch of salt and heavy cream and beat another 3 minutes or until the frosting is light and fluffy. Add more cream to your liking. If desired, color half the frosting red with a drop or two of red food coloring. To make the marshmallow frosting: Bring a small pot of water to a simmer. In a heat proof bowl, add the egg whites, sugar and cream of tarter. Place the bowl over the simmering water and whisk constantly for 4 minutes. Remove from the heat and beat the mixture, starting on low speed and gradually increasing the speed until stiff peaks form. Stir in the vanilla. If desired, color half the frosting red with a drop or two of red food coloring. Make the ganache. In a microwave safe bowl add the cream, butter and chocolate. Microwave on 30 second intervals, stirring after each until smooth. Stir in the instant coffee until dissolved and smooth. To assemble the cupcakes use a small paring knife to cut a cone-shaped piece from the center of each cupcake. Fill the hole with the the chocolate ganache and if there is room return the top of the cupcake to the hole. Pipe or spread on either the marshmallow frosting or the buttercream frosting. 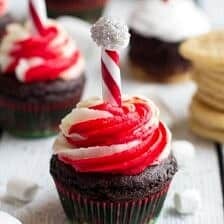 To swirl the frosting, spoon half of the red frosting into one piping bag (or use a ziplock bag) and half white frosting into the another piping bag. See my photo above. Place both the bags of frosting into a larger bag fitted with a piping tip. Pipe onto cupcakes as desired. Take one candy cane and break it in half. Dip one side of the candy cane into a little of the frosting and then roll the top in the sprinkles (it is helpful to add the sprinkles to a bowl). Stick the pole right in the middle of the cupcake. And your are done! Store cupcakes in an airtight container at room temperature for up to 3 days and in the refrigerator for up to 5. Oh and that layer of ganache you see there? It is my favorite! I have a similar picture of Christmas in my head and I’m not 5 either. 🙂 These cupcakes are adorable! I like everything about them, the peppermint, the marshmallows, the chocolate, all of it. Pinning! You seriously just blew my mouth off my face with these cupcakes meets cookies! 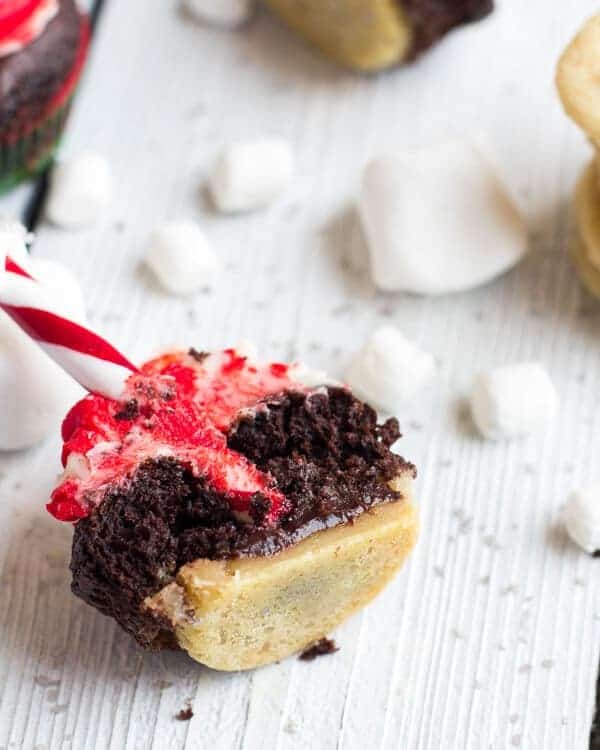 Not only are they ridiculously cute and uber Christmas-y..they are 2 of the best desserts all wrapped up into one dessert transformer. Ya, these are a must. Pinned! So pretty!!! The marshmallow frosting only has to be over the boiling water about 4 minutes??? I do mine the whole time which is about 8-9 minutes. Mine also has white karo syrup but I would love to have a good recipe without it. I am not a candy cane eater either. I do like mint though. Thats is just what Martha (Stewart) said, so I listened! LOL! To be honest, it tasted amazing, but I had a hard time getting it to stiff peaks. Next time I will try doing 8-9 minutes and see how it goes! Omg, these are the cutest things ever!! They would be so perfect to put out on the dessert table. I LOVE that double-colored frosting. Gorgeous! Thank you, Julie!! The frosting is so fun! I envision Christmas the same way you do…lots of white fluffy snow, never-ending mugs of hot chocolate, and Christmas lights all around. Yup, sugar cookies are a MUST on Xmas, and having them be the surprise at the bottom of a delicious cupcake is sheer brilliance! Love your ideas, my dear! Thanks Julia!! Did Tahoe get some snow this week too? Ok, these are just the cutest things I’ve ever seen. And the fact that you added a sugar cookie dough base is ridiculous. In a good way. Love the little sparkly topper on these Tieghan! We have lots of snow if you want some. 😉 These are so creative. Love them! 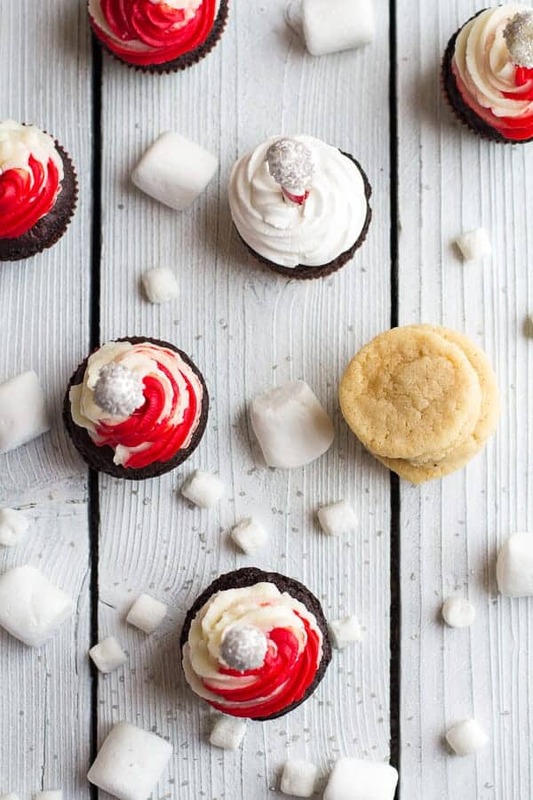 Cookies and cupcakes together?! Where have these been all my life! 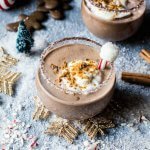 These look so decadent and festive! And I love the North Pole idea, which I think I’m going to steal for the gingerbread house I’m decorating this weekend. Thanks Megan!! Have fun with that house! 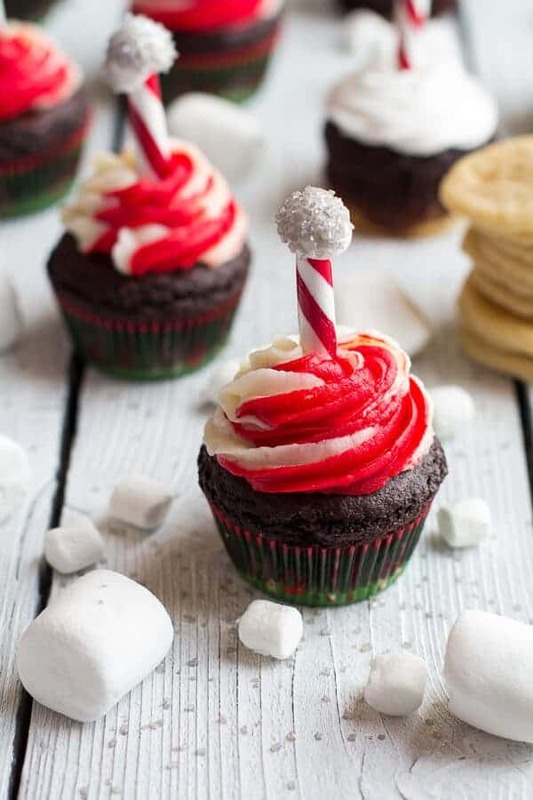 Oh my gosh, these are the cutest holiday holiday cupcakes ever!! 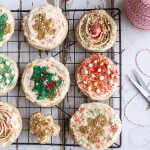 Especially love the sugar cookie bottom. These are the cutest lil things ever! Period. This is why I love this time of the year – cool bloggers like you get seriously creative! Love this. Haha! Thanks so much, Ali! WOAH! These are A LOT of work, but look incredible. But it is the holidays, worth the extra effort! 🙂 Thanks so much, Sally! I hoped you would like these!! 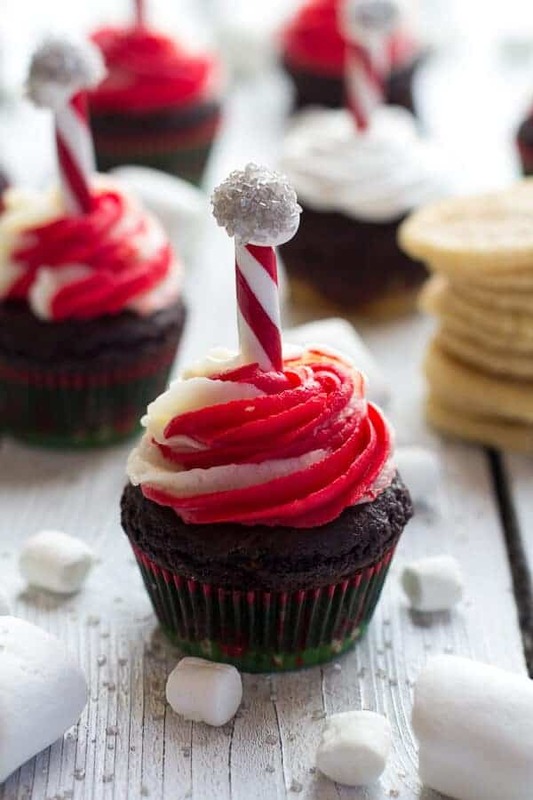 What a gorgeous festive cupcakes! So cute and clever for the holidays! Love! 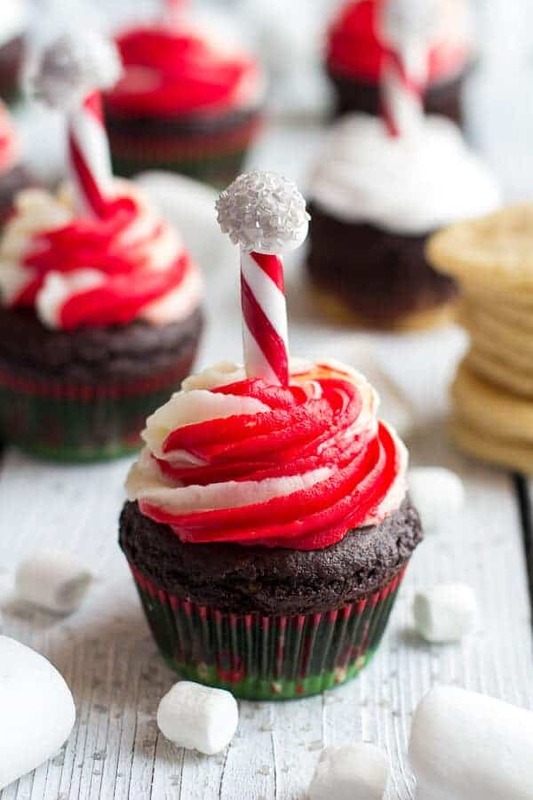 These are adorable and so festive! Love the combo of cookie and cupcake! These are gorgeous! They’d be so perfect at a Christmas party. What incredible cupcakes, I love the swirled frosting! What an amazing recipe – these look so delicious! I love your vision of Christmas – it is spot on. I would love to curl up by the fire with one of these cupcakes! Hope you have a great weekend – can’t wait to see what you’re cooking for us! It’s a cookie cupcake with the best frosting ever. Love! 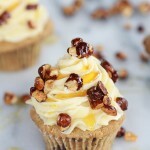 This is one of my most favorite cupcakes I have seen in a long time! Did you have fun in Summit?? 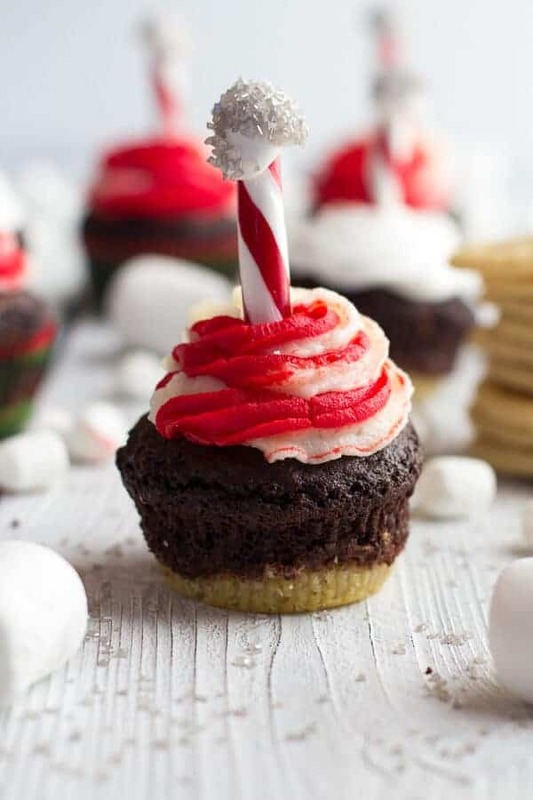 Everything I love about Christmas in one cupcake! Brilliant! These are the cutest things ever… and I’m pretty sure they taste god too! i love the way you decorated them. they are so cute! I’m still stuck on the part where you put a sugar cookie on the bottom of the most glorious chocolate cupcake the universe has ever seen. I mean, WHY DON’T I LIVE WITH YOU?! Also, those peppermint marshmallow swizzle sticks? ADORABLE. Haha! I love you comments. They make me smile every single time!!! I’m going to try these out to bring to a Christmas Eve dinner we’re invited to annually. Will let you know how it goes. YAY!! Hope you guys love them!! Thanks Anita! I made these for my boyfriend yesterday and him and his family said they were “off the charts! !” Thanks so much for sharing! I am a huge fan of your Simple Chocolate Birthday Cake, so I was perusing your other cake recipes and noticed this recipe is similar. I was going to use the Simple recipe to make cupcakes for an upcoming birthday party. How does the chocolate cupcake in this recipe compare to the cake in the Simple recipe (ie, taste, texture)? The ingredients and/or measures are only slightly different (no Greek yogurt). I suppose I could try it, but then I would have to eat them all! Thanks.